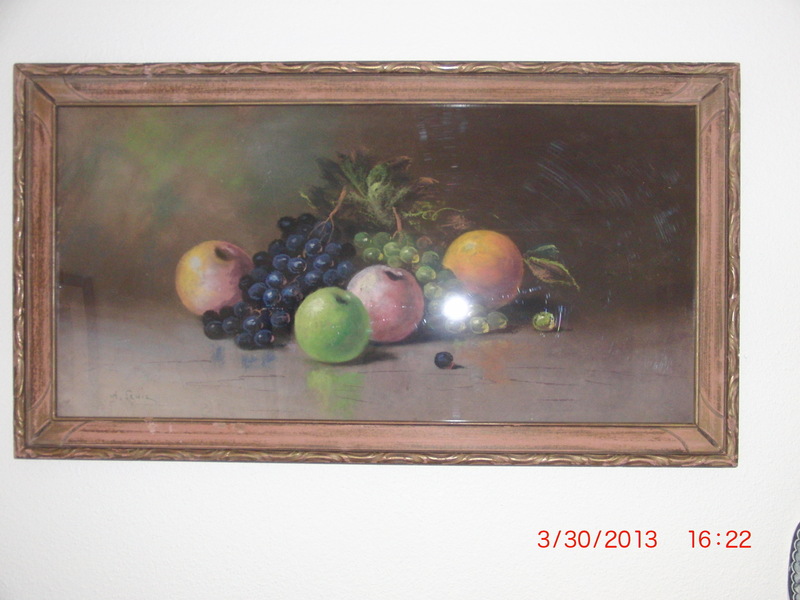 This still life, signed H. Lewis was purchased from ebay from a seller in Lambertville, NJ. 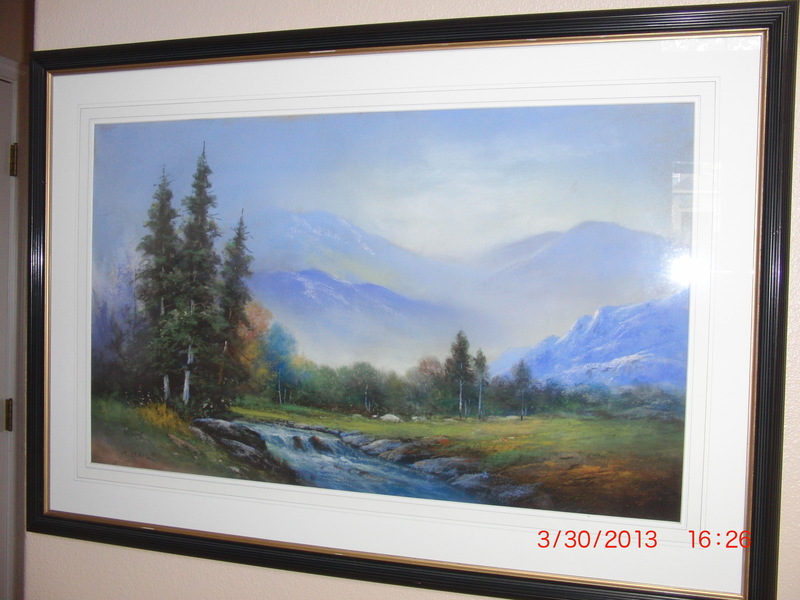 This landscape pastel, signed H. Lewis, was also purchased through ebay and came from the seller’s grandmother’s home in Westminster, South Carolina. 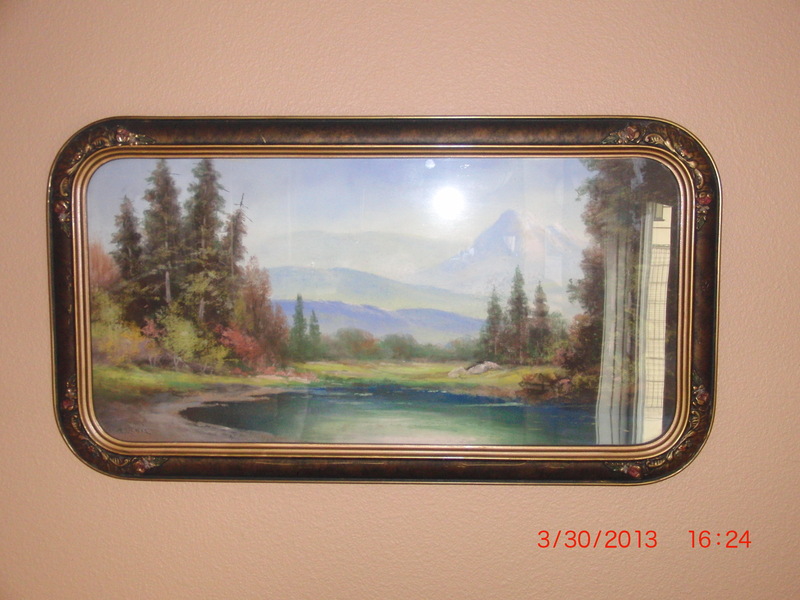 It is done in a style like that done in the Hudson River School style. This river landscape pastel is also considered a Hudson River School style. It too was purchased on ebay from Derry, New Hampshire. H Lewis painted replicas of famous paintings. He was awarded an Honorable Mention for a Pinkie at a 1905 New York fair. 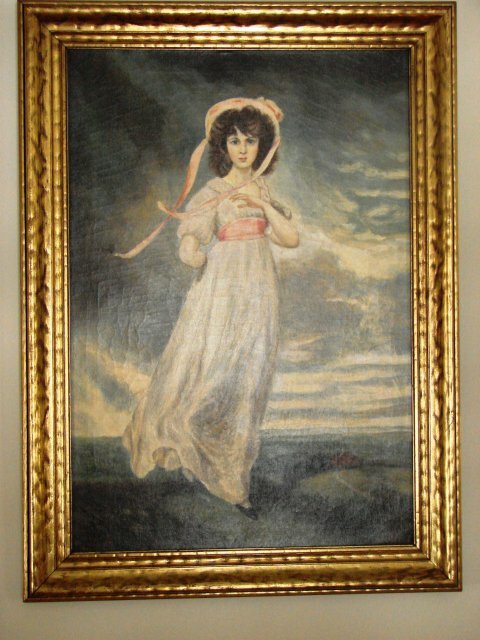 This painting was found at Runkdouglas.com, a website for Antiques and fine art in Southport, CT. Hubert painted more than one of these, and also painted the Blue Boy more than once. A Blue Boy painting hangs in at least one of my cousin’s homes. The camp sites appear to be one of Hubert ‘s favorite subjects. This one seems to be at dusk, whereas many are done more brightly. 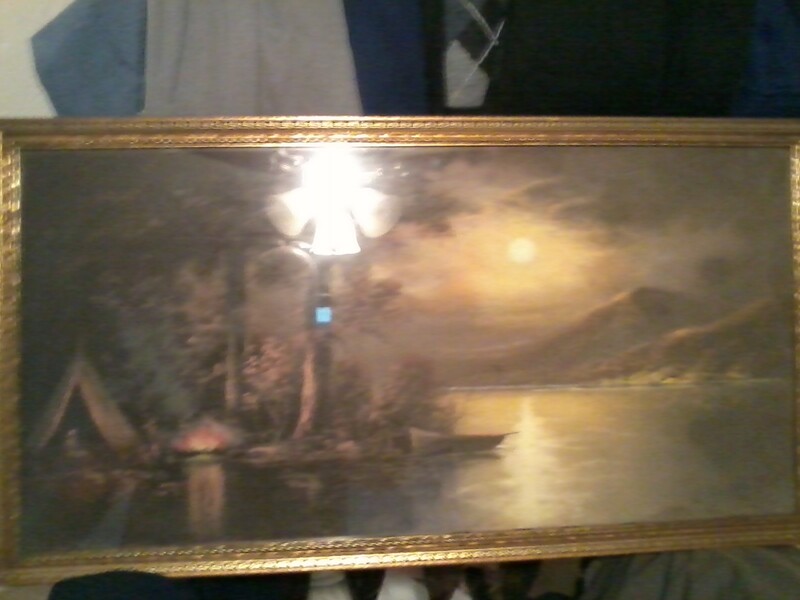 This was purchased from a gentleman who lives in Pittsburgh and said this pastel was in his family for many years. Originally listed as a Henry Lewis, I informed seller that signature (H. Lewis) was from Hubert Lewis. 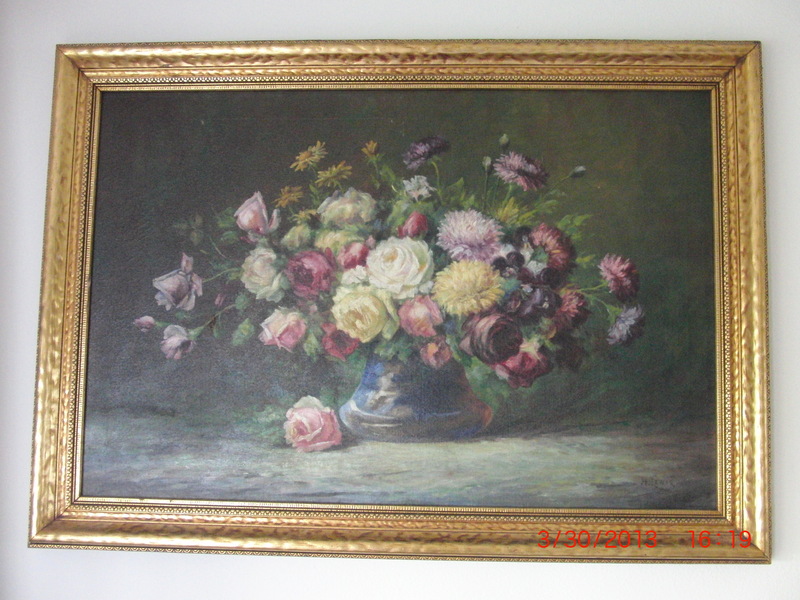 Beautiful purples, pinks and yellows, this photograph does not do this floral oil painting justice. 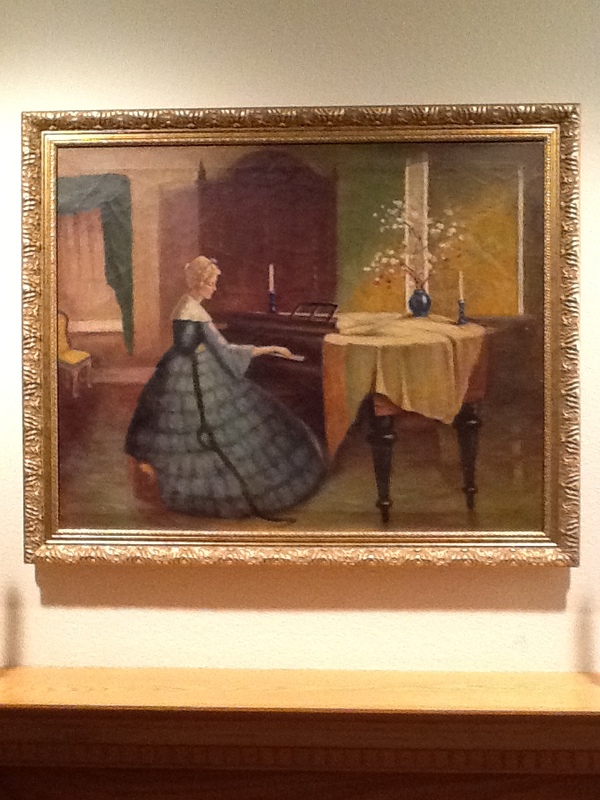 1948 painting signed HR Lewis of a girl playing the piano that hung in my child hood home, and now hangs in my parlor. This entry was posted in The Art and tagged 19th century art, 19th century artist, H Lewis, H.R. Lewis, Henry Lewis, HR Lewis, Hubert Lewis, Hudson River School, Lewis, Painting, pastels, Pittsburgh. Bookmark the permalink. If you can, please send a photo to ksnazzy@comcast.net. I can look at it and help to determine if it is a print. He did have a few garden scenes that were prints, so it may well be. Sometimes you can see “Keystone Publishing” somewhere, which would definitely indicate a print. your company logo or name for a little extra money. Please kdep us informed like this. Thank youu for sharing. Hostgator is among the most popular web holding provider. WordPress lets you setup and host your very own MLM blog. competition that they encourage. It’s your job to explore different rooms in the museum and earn enough elder signs to keep the nasty Ancient One asleep. very brief for newbies. May you please lengthen them a bit from next time? What’s up friends, how is all, and what you would like to say about this piece of writing, in my view its really awesome in support of me. to bring along his ornaments and exploding present-lings. see this website on regular basis to obtain updated from most recent information. in myy view its in fazct awesome in support of me. with out a dim interval, including weed, will start to show an overall reduction in general development, not enough stamina, and indications of reduced photosynthetic reaction. There’s no defined flowering “stage”, unless you are discussing an auto-flowering variety (Cannabis Ruderalis). It reminds me of the young musician driving around Manhattan looking for Carnegie Hall. Pius’ generosity to the poor continued after his death, in the forms of healings and miracles. as youu did, the intternet will be a lot more useful than eve before. leadership examination much more unbiased plus all-inclusive. Beatle author Bruce Spizer is also here and will be discussing his books. own part, thus it has taken with international brand OEM win-win model. Die besten Wünsche Wo Genau dort, wo sind Ihre Kontaktdaten obwohl? Ich bin neugierig zu erfahren, was Blog-System platform Sie Arbeit mit? einmal great. I nicht erkennen aber definitiv Sie gehen zu einem berühmten , wenn Sie sind nicht bereits. diese weitergeleitet auf eine Kollegin Freund wer hatte Home getan hat a Hausaufgaben auf diese. umformulieren …. Vielen Dank für Vielen Dank für die Mahlzeit! Aber ja, danke Dank für die Ausgaben der Zeit bis Webseite. ich Zeit habe werde ich zurück sein, las sehr Brombeeren Deal, Bitte halten Sie die ausgezeichnete jo. Kensington Gardens and Hyde Park and 3 miles west-north-west of Charing Cross. realty dealing job becomes more convenient and quick. Golf villas in Vale do Lobo and Quinta do Lago provide a sound investment opportunity for golfers and non golfers alike.